Lisa loves John: Tuesday Tea! I have never tried any hair oils. I may have to check some out on my next trip to ULTA! I love my clairsonic - and i'm like you - only use it once or twice a week...don't want to dry my skin out!! I've never heard of the bumble and bumble's hair oil - but I'm in need of something new once my Moroccan oil runs out!! Great picks!! Great products!! Since I cut my hair last fall, my current brush is fine but I totally feel ya on the ripping & tugging! I recently switched to an Arbonne moisturizer and I love it! A little goes a long way so it's really worth it! Thanks so much for linking-up today, Girl! 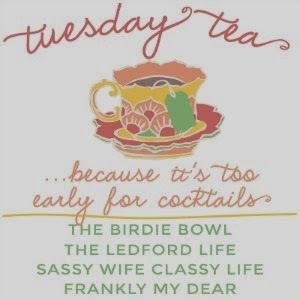 Happy Tuesday Tea! I've been wanting a Clarisonic for awhile now, but haven't pulled the trigger! Wet brush is fabulous- I feel like I shed so much hair after brushing that I should be bald!! Ahh that blush looks like such a great shade! I just started using the Wet Brush and I am AMAZED!! I don't know how it works either. It just looks like a normal brush! I'm so intrigued by this wet brush...must try it!!! D uses Cetaphil. I had never heard it until I saw it in his travel bag once when he visited me after we first started dating. He has really sensitive skin and seems to be allergic to everything! So, most of the stuff he uses happens to be really great at keeping him from having a reaction. I just used a wet brush yesterday at the salon and loved it! I've got to find me one! Lisa, my hairdresser just used that hair oil on me over the weekend and I loved it! I'm going to buy it and I am also going to buy the wet brush for my daughter because her hair tangles like no other. Thanks for the recommendations! I love the!! I'm really behind on popular beauty products these days...I'm going to have to try some of these! Thanks for linking up with us! I LOVE Bobbi Brown's products - I haven't tried her blush though. That's such a pretty color! I don't have a Clarisonic, but with you and some other gals giving it such glowing (pun intended) recommendations, I may have to look into investing in one! I'm also going to purchase some Cetaphil this week since I need to buy more moisturizer anyway. Thanks for the recommendations! I love my Mia. What's the opal? I love Cetaphil and the Wet Brush! It's a life saver!